You can get so much from CVS and with so many locations usually they are just around the corner. Who still need to do some shopping? I’m done but even I could use this gift card, love it! We have a great giveaway for you this weekend! 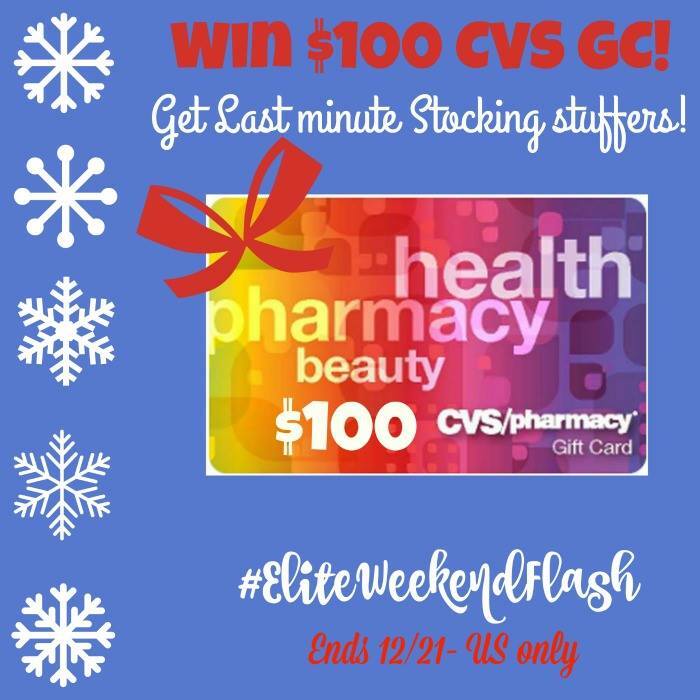 Enter to win a $100 CVS gift card. If you’re looking for some fabulous gift ideas you should check out our Gift Guide. We’ve got suggestions for him, her, the kids, teens, tech and gadget lovers, the family and the beloved pets. 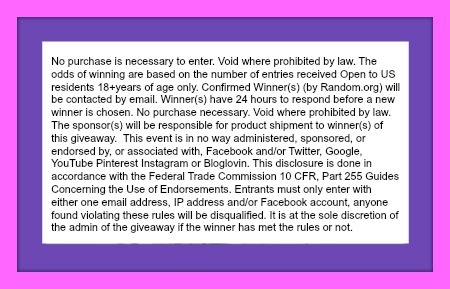 We have lots of other fabulous giveaways going on too so make sure to check them out. From a Ninja Coffee Bar to the newest Darkside Ollie gadget that kids and adults alike will have fun playing with.! Disney Frozen Themed White Hot Chocolate Recipe! and so many more, make sure to check them out. GOOD LUCK! Cereal, milk and peanut m&m’s. My favorite thing to buy at CVS is makeup. I usually buy vitamins and over the counter cold medicine from CVS! I like to purchase cosmetics from CVS. They always have really great sales! I like to buy makeup and seasonal items! I like their flavored water and medicine and makeup. I like to quick up my prescriptions at CVS. They have great prices and co-pays. Actually, my favorite things to buy is seasonal decor. CVS is where I pick up my prescriptions also like buying beauty products there. I get awesome deals at CVS on haircare products, toothpaste and toothbrushes and makeup. My favorite things to buy at CVS is Shea Moisture and Nubian Heritage products, Dove body wash.
Also I love buying my Simple and Aveeno face wash products! Thanks for the chance! I buy my haircare products from CVS. my vitamins that I need daily.. I love to purchase my beauty products and some household items too! I love CVS and there is an awesome new one right down the street from my house! One of my favorite stops for sure. They have great coupons & deals! I love the deals on household items from razors to toilet paper and papertowels. Their extra bucks program is the best! I like to buy shampoo, soap and cat litter at CVS. I buy everything from household items to holiday items. I love CVS! I buy skin care products, hair products, vitamins and seasonal products at CVS. snacks, small gifts. I love hitting after holidays and grabbing clearance goodies! I buy mainly skin and beauty as well as candy 😉 from CVS! I love buying candy. We use a lot to decorate gingerbread houses. I like to get my Arizona Tea at CVS, where they are often on Sale. over the counter medicines and personal products. I buy candy at CVS. I like getting makeup at CVS! besides makeup, snacks and some baby things, I also like to look through their seasonal things like Christmas ornaments and decorations and their valentine stuff. A lot of their seasonal stuff Is great. I worked there for a year and loved watching the sales. but they are a horrible company to work for! My favorite thing would be beauty products. Because of their extrabucks I love to buy just about everything at CVS. I buy all my hygiene and cleaning stuff there. love win for my birthday and for Christmas.. I love the hair products that they have. CVS is where I always go. I love to buy my cosmetics and personal needs at CVS. I like to buy makeup, hair products, and vitamins. I love to buy beauty products and medications at CVS. I buy shampoo at CVS. Love to buy our shampoos, dental products, paper products and other things at CVS! They have great sales! Milk, diapers,medicine, makeup,treats,etc. Love cvs! Thanks! I love their Extra Bucks program, It helps us make ends meet. I buy beauty, hair, and over the counter products at CVS. I buy my Milk at CVS . A gallon is 3.29 and I get a $1 off coupon so I stop twice a week . 2 gallons of milk for under five bucks!! Health & beauty products and makeup. I like to buy Hallmark gifts and cards. My favorite things to buy at CVS are makeup, snacks and candy. I love to buy things that have Extra Bucks, either necessities or new products I want to try. I buy food, cosmetics, personal care items, you name it! They usually carry unusual seasonal items. My favorite thing to buy at CVS is cosmetics. I like to buy diapers at CVS. I get my medicine there. I love their CVS bar soap!!! I’m getting some now! I really like the make up section, so much to choose from, thanks! I like to buy hair care items. That and perfume. I haven’t been there in a while. What are you favorite things to buy at CVS? I love buying makeup and hair supplies at CVS, there’s always good deals! I don’t generally shop at CVS often. I buy all of my over the counter drugs and personal care items at CVS. I get my prescriptions filled and get my flu shots at CVS and when I shop I usually buy makeup and cards. Favorite things to buy at CVS are vitamins and laundry detergent. I like buying makeup and hair color at CVS. We get our prescriptions filled there and I also like to buy my makeup there. CVS is the first place I ever go when I need to restock on cold medicine for the entire family, and vitamins! I love earning CVS Bucks in the process, you can usually find pretty good deals on other items as well. My kids personally love their snack isle. I love to buy health and beauty products! I love to buy my shampoo and conditioner there and make up for my daughter,she loves to go there. I love buying makeup and snacks at CVS. I love buying makeup at CVS. I love getting anything on sale there! I usually get hair products and holiday items that go on sale. My favorite things to buy at CVS are health & beauty items, paper goods & otc meds. I like to get the CVS Gold Emblem Abound products, especially the fruit items like Fuji Apple Crisps. And also other snacks and treats, they have also been having a good price on milk so I’ve been getting that at CVS too. I’d give the gift card to a friend because she’s on the verge of moving out and it’d help her to get a lot of household products (toilet paper, paper towels, cups, etc…). It’d obviously go towards household items and snacks and drinks, probably. My favorite to get is makeup at CVS. I love getting my beauty and hair care products there. And they usually have good sales. My favorite items to purchase at CVS are their gift ornaments, food items, dollar choices that are adorable and of course beauty products! I like to buy health and beauty products from CVS. I like to get skin care products at CVS. I live to buy clearance gifts and decorations after the holidays! I love buying my make-up from CVS! My favorite things to buy at CVS are makeup and other health and beauty products. I like to shop their specials and I I often find good buys on candy. Beauty products are my favorite. I buy lots at CVS, but my favorite thing has to be candy! I love all the seasonal, fun candy they have! I pair it with a great sale, and I buy my weekly sugar fix! I love their snack area. I also love buying makeup there. They always have such a neat, clean, organized make up section. I like buying my milk at CVS because it’s always cheaper and I love the extra bucks! My favorite things to buy at CVS are vitamins, supplements, and skin care products. My favorite things to buy at CVS is hair care products. I usually buy milk at cvs but you never know what else you’re gonna find there. My favorite thing is their vitamins. b1g1 is a deal there.